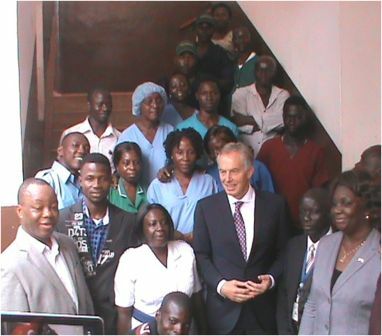 Speaking to the Local Press during his visit at the Connaught Hospital in Freetown, Tony Blair expressed his commitment to ensuring that Sierra Leone’s health care system is complemented with specialized units that would help develop the country’s human resource capacity and logistics. 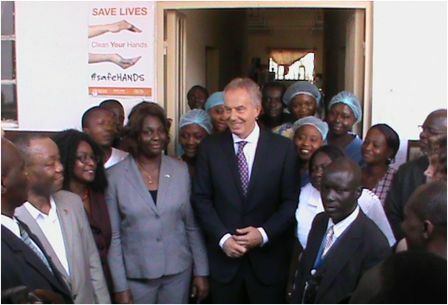 The Former Prime Minister noted the strides made by frontline health workers during the Ebola outbreak which has led to the country moving to zero cases that hopefully would be sustained. He visited several units including the Dialysis Unit, the Male Surgical and Paediatric Wards, and demonstrated his appreciation over the country’s progress by embracing the staff of the hospital, cleaners inclusive with group photographs. 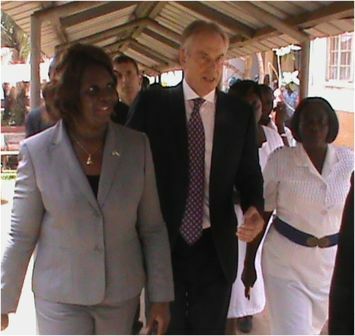 Deputy Minister of Health and Sanitation ll, Madina Rahman lauded Tony Blair for the visit, describing it as a welcome motivation to the health workers. Commenting on the purpose of the visit, Madam Rahman said one good thing about the visit, is to assess the level of where we are currently, and to explore additional areas for assistance that would help build the structural frame work within the country’s Post Ebola Recovery Plan. Giving update on the status of the hospital, the Matron, Isatu Kamara said over 4000 cases were seen at the height of the Ebola crisis, adding that there has been no Ebola case for the past six weeks. She expressed optimism over the pledged made by the Former Prime Minister to help improve the Dialysis Unit and other logistics support, describing the visit as a treasure to her entire staff and hospital management. 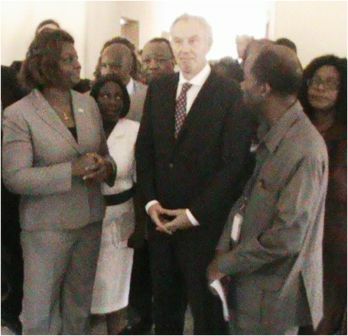 Other highlights include several group photographs with staff of the hospital and a visit to the different Units.